Blackcurrant leaf: what is it? Durint the first years of Synofit’s existence, the Blackcurrant leaf (Ribes nigrum) was not emphasized. The most striking ingredients of Synofit were GLMax® liquid Green-lipped mussel and Bio-Curcumin BCM-95®. Later on, in Synofit Premium Liquid, Boswellia was added. Even so, Blackcurrant leaf was already a key ingredient of the succesful Synofit Premium formula in those early years. The Blackcurrant is, like the Redcurrant (Ribes rubrum), a member of the Ribes family. The Latin name of the Blackcurrant plant is Ribes nigrum, where ‘Nigrum‘ refers to the dark colour and ‘Ribes‘ to the berries. The plant grows in the wild in large parts of Europe and Asia. You can also buy a plant in many garden centres, which can then be used on a soil of moss, loam, clay or sand. The berries are widely used for making Cassis. All kinds of interesting health benefits are attributed to the berries, the seeds in the berries, the leaves and even the young flower buds. Synofit uses the leaf of the plant. The use of Blackcurrant leaves has been around for centuries. The fact that the Blackcurrant leaf has a nourishing effect on joints is an article 13-claim from EFSA that can also be found on our packaging. Because of the legislation, we cannot go into detail about this on our website. If you want to know more about how the Blackcurrant leaf is good for the joints, it is better to consult other sources. For example, via Google. For health professionals (medical specialists, doctors, and therapists) we have information available. Please contact us. Synofit chooses the best quality for the Blackcurrant leaf. In contrast to the Green-lipped mussel, which is used unprocessed, an extract is used from the Blackcurrant leaf. This is a 1:10 extract, which means that the active substance of 10 times as much leaf is used (per daily dose, for example, Synofit Premium Liquid 180 mg leaf extract, which is extracted from 1800 mg leaf). 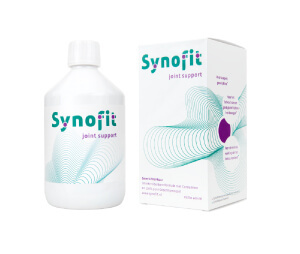 Moreover, the most important substances involved are concentrated in Synofit Premium. In addition, the Blackcurrant leaf used is organic. The extract Synofit uses for Synofit Premium products is Skal certified (Dutch control on biological production). 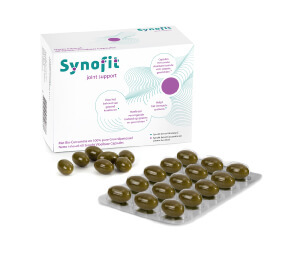 In our webshop we sell Synofit Premium with 100% liquid Green-lipped mussel, Curcumin and Blackcurrant leaf. Below are the two main products: Synofit Premium Liquid and Synofit Premium Capsules.